Martin O'Neill says he would be guessing if he tried to put a time frame on when Seamus Coleman might return to football. However, the Ireland manager has a clearer view on the tackle that broke his leg, with the evidence of replays leading the 65-year-old to describe Neil Taylor's controversial challenge at the Aviva Stadium as "very poor". O'Neill has also put Gareth Bale's lunge on John O'Shea just beforehand in the same category. He was unable to comment on Friday night, claiming that he needed to watch the main talking points again, and he spoke to BBC radio yesterday morning to offer an updated opinion. "I've seen the challenge and the (Bale) challenge on John O'Shea and they are very poor challenges," said O'Neill, who refused to discuss the subject of Taylor's ban - the Aston Villa player is awaiting news on his punishment. His primary concern was Coleman's wellbeing, having gone to see the player in the hours after the game ahead of his Saturday morning operation under the care of the FAI's orthopaedic surgeon, Professor John O'Byrne, and former Olympic swimmer Gary O'Toole, who now works as a consultant orthopaedic surgeon. The Everton man suffered a double fracture, but it's understood to be a relatively clean break. However, the early stages of the recovery period are vital in terms of determining the road ahead. "It will take some time to heal, it was a double break, but it has been pinned up now and screwed in," said O'Neill. "I know the doctors and surgeons are all pleased with the way the operation has gone and now it's time for recuperation. "It will obviously take some time. Seamus has great determination and sometimes these things work very well in your favour. "I'm not exactly sure (of the time frame), I must admit. I would only be guessing," he continued. "I think even the doctors and surgeons wouldn't be terribly sure. Sometimes there are complications afterwards and it can be more prolonged. Other times it can be clean and clear sailing and everything is OK, but it's very hard to say at this stage. "It's a devastating blow for the lad, he's having a phenomenal season at his club and for us as captain of our team." 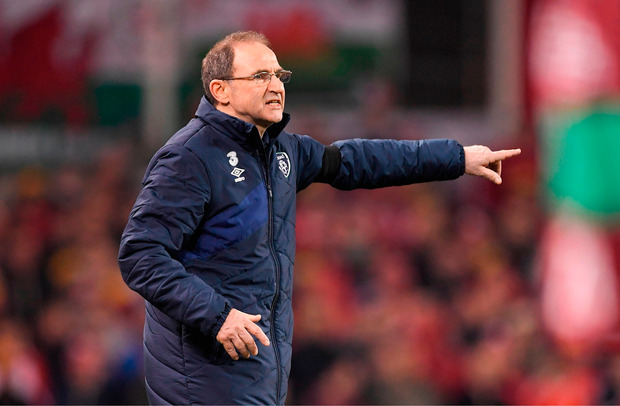 O'Neill reflected on the uninspiring game that brought back memories of the Euro 2016 campaign. "It was a tough game, almost like a British affair again, much as the way it was with Scotland in the Euro qualification group. The first-half wasn't terrific, the second-half certainly improved from our viewpoint and we got very strong towards the end of the game. "As I said at the very beginning of the campaign, teams are capable of taking points off each other. That has been proved and that will remain so right until the end of it. "There's still a long way to go, and we've points on the board which will hopefully stand us in decent stead, but that's all." Ireland will make a raft of changes for tomorrow's friendly with Iceland. O'Shea, Glenn Whelan, Jon Walters and James McCarthy have all left the camp. O'Shea suffered a shin injury as a result of Bale's rashness. Birmingham's Stephen Gleeson has been called into the panel after originally being cut from the provisional squad for the Wales match. Ireland are light on strikers, with Kevin Doyle in line to feature as Shane Long is the only other frontman in the squad as it stands. Conor Hourihane and Daryl Horgan are in contention to win their first caps. Brentford's John Egan made the bench ahead of Dundalk's Andy Boyle on Friday, but both players will be targeting some kind of involvement against the Euro 2016 surprise packages. An all-Derby pairing is a possibility, with Alex Pearce - who was also a sub against the Welsh - due a spin. Richard Keogh has stayed around for the game. Robbie Brady will figure after missing Friday night through suspension. The FAI anticipate a healthy turnout, with a large number of tickets sold as part of a double package with the Welsh encounter. Association insiders claim the Iceland turnout could exceed 40,000, although that would depend on every ticket holder deciding to make the journey.